Rome (Agenzia Fides) - "The Central African Youth is sick" said His Eminence Cardinal Dieudonné Nzapalainga, Archbishop of Bangui, capital of the Central African Republic, on the margin of the XV Ordinary General Assembly of the Synod of Bishops with the theme "Young people, faith and vocational discernment". "Three quarters of my country is occupied by rebels", explains the Cardinal. "Many young people have not gone to school since 2013. This is a concern for me and also for other pastors. We see many young people have taken up arms, take drugs, several others have no prospects for life, we must try to help these young people together". 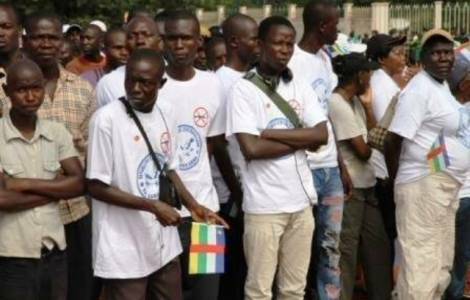 The future of young people in Central Africa should be a central theme for local politics and for the international community itself, given that half of the population is under the age of 18. The same is true for the Church. Cardinal Nzapalainga emphasizes that "the Central African youth dreams one day of becoming adult and responsible. Young people want to occupy a position, give their contribution. We must encourage them. If we do nothing, we bury a talent. Many young people have dreams, and if we do nothing to help them, they fall into pessimism".